Do you want to advertise on your customer's desk for whole year? Printing Singapore calendars as a 2019 corporate gift will be the answer for the question above. Below are the reasons why we should print Singapore Calendar as corporate gift. 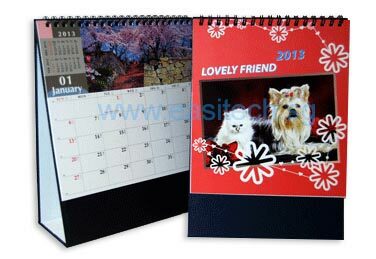 Easitech Pte Ltd provides full range of calendar printing services. Below are the 2 types of most popular calendar and they are all desktop calendar. We have more than 50+ Singapore 2019 calendar designs for selection. There is advertisement space at the lower part of the calendar stand. After select the calendar design, just give us your information for advertisement to hot stamp. The price listed included hot stamp service. Click here for all the Singapore 2019 calendar designs. How to select the type of calendar for printing? Advertisement area, price, and quantity are three deciding factors for selection of the type of calendar for printing. B) 8 Sheets Customized Calendar/ 14 Sheets Customized Calendar" has the biggest advertisement area. With 8 sheet or 14 sheet of customized design, you can turn the calendar into your products or services catalog. Besides, you can also mark an important date on your customer calendar or print a note on the calendar to remind your customer to use your services or products before the festivals or events. This is not only can pontetially increase your sales, it is also very helpful for your customer to do their planning. If your quantity is low, the price to print customized calendar is few times higher than A) Hot Stamp Calendar. On the other hand, A) Hot Stamp calendar is much more cheaper if your quantity is low. You also do not need to worry about the calendar designs. We provides more than 50 designs for Singapore 2019 calendar. You just choose the calendar designs, and provide the advertisement information to be hot stamp at the lower part of the calendar stand. Click here to download calendar template Singapore in adobe illustrator format.